Surely the most original Broadway production on offer right now, The Curious Incident of the Dog in the Night-Time takes us on a fascinating inner journey that few plays attempt. Most of the time, we in the audience are placed in the God position, viewing the action from a position of omniscience, judging the characters as we will. 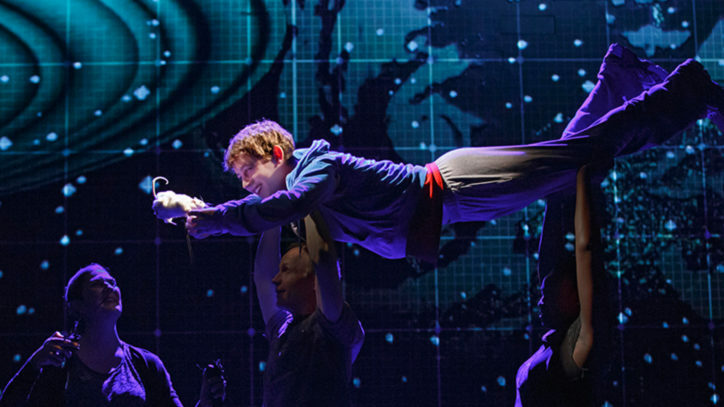 The creative team behind Curious Incident will have none of that; instead, they take us into the mind of a 15-year-old boy who, though never specified, may suffer from some version of Asperger’s syndrome or high-functioning autism. Adapted by Simon Stephens from Mark Haddon’s international bestseller, the play focuses on Christopher, who lives in a small English city with his father, Ed. Christopher is brilliant at math and has an astonishingly retentive memory, but caring for him can be brutally difficult: He is repelled by certain colors. He can’t enter the homes of strangers. He cannot process metaphors; an expression such as “apple of one’s eye” constitutes a foreign language. He perceives signs and omens in different colors and numbers: If he passes five red cars on the way to school, it will be a good day. Most challenging of all, he cannot be touched. The action of the play is triggered by the killing of a neighbor’s dog, discovered by Christopher, with a pitchfork in its side. Ordered to leave well enough alone, Christopher sets out to find the murderer; instead, he unearths a set of family secrets that shatters his relationship with Ed and sends him on a perilous journey to London. The task facing the designers was to create a theatrical language that could express Christopher’s uniquely skewed point of view. In Bunny Christie’s set design, all three walls and the floor resemble the graph paper used by mathematicians, a reference to Christopher’s rigidly orderly mind. The walls and floor serve as projection surfaces that Finn Ross, the video designer, covers with images of Christopher’s chalk drawings, his favorite constellations, calculations, maps of England, and overhead photo views of London. When Christopher gets on a “train,” made up of boxes arranged in rows, we see the landscape, drawn in chalk, outside the window, passing by. In addition to her regular lighting rig, Constable has embedded LED lighting units in the walls and deck. Thus, lighting works in concert with the video — so well, she notes proudly, that it is sometimes difficult to tell them apart. The constellations mentioned above are created by a series of video lines crossing the walls, connecting to the dots of the lighting units. “Every time a projected line crosses the grid on the wall, rather like an Etch-a-Sketch, it causes one of lights to be illuminated,” Constable says. Some of the most powerful design moments show Christopher’s mind in distress. As the boy retreats physically and emotionally from information that he cannot process, the walls and floor are covered with cascading numbers, a visual metaphor for his loosening grip on reality. (Numbers are his solace; at times, he calms himself by running square roots in his head.) Video, lighting, and sound all collaborate to especially powerful effect when Christopher, now completely out of his element, lands in London’s Paddington Station, rendered as a terrifyingly treacherous environment marked by sensory overload. Images of signage and maps loom ominously, lighting creates a constantly shifting environment, and Adrian Sutton’s music and Ian Dickinson’s sound effects blend in cacophonous fashion. “Being surrounded like that is the worst moment for Christopher,” Constable notes. “We needed to make it the most awful moment for him.” The sequence climaxes, harrowingly, in a tube station, where Christopher jumps onto the tracks to recover his pet rat. This is represented by a trough in the stage floor, with lighting units and sound effects creating the sound of an oncoming train. Coordinating all of these design elements is an enormous challenge. For example, in the Paddington Station scene, Christopher climbs a ladder on the upstage wall and descends an “escalator” that consists of steps jutting out from the on wall, on which has been superimposed, via video, a cutaway view of an escalator’s inner machinery. Such effects, combined with sound, required sophisticated programming technology to make them happen correctly. The first version of Curious Incident was staged in the round at London’s National Theatre. When it transferred to the West End, the design grew exponentially, as Christie added the three walls and more effects were required. “It added to our work,” Constable says, “but the production has very, very clear rules,” which made expanding it easier that one might first imagine. 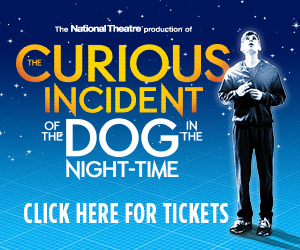 Buy tickets to The Curious Incident of the Dog in the Night-Time.